EVANSTON, Ill. – Northwestern head coach Paul Stevens today (Dec. 7) announced the Wildcats’ 2010 schedule, featuring a doubleheader against the University of Wisconsin-Milwaukee at Miller Park in Milwaukee. After playing games at the Hubert H. Humphrey Metrodome (Minnesota Twins) and U.S. Cellular Field (Chicago White Sox) last season, the Wildcats can add a visit to another Major League ballpark to their resume. The twinbill against UWM will be played April 28 following a 12:10 p.m. game between the Milwaukee Brewers and the Pittsburgh Pirates. NU is scheduled to play its first 23 games away from Evanston beginning with two games apiece against George Mason and Winthrop Feb. 19-21 in Rock Hill, S.C. The Wildcats compete in the second-annual Big Ten/Big East Challenge the following weekend in Florida, taking on Connecticut, Rutgers and Seton Hall in the St. Petersburg/Clearwater area. The Wildcats make a return trip to the Metrodome March 5-7 where participates in the 26th-annual Dairy Queen Classic against host Minnesota, Loyola Marymount and Oklahoma State. NU follows up the trip north by heading to Las Vegas March 11-13 for a four-game series against UNLV. Northwestern embarks on its spring trip March 20 as it starts things off in Winter Haven, Fla., where the ‘Cats face Bucknell, UMBC, Cornell and Dartmouth. NU then heads to Deland, Fla, where it plays four contests against Stetson March 26-28. The Wildcats return to Illinois and set to play a solo contest at UIC March 30 before opening Big Ten play at home April 2-4 against defending Big Ten regular season champion Ohio State. On the heels of a mid-week game against Northern Illinois that is being played in Rockford, Northwestern hits the road in conference play for the first time April 9-11 as it treks to Penn State. Minnesota invades Rocky Miller Park the following weekend, followed by a home game against Illinois State. NU then embarks on stretch during which it plays its next nine games on the road beginning with three games at Purdue April 23-25. Following the doubleheader against Milwaukee at Miller Park, the ‘Cats play a weekend series at Illinois and then a solo game against Valparaiso at U.S. Steel Yard in Gary, Ind. Northwestern finally returns home May 7 as it faces defending Big Ten tournament champion Indiana in a weekend set. After a home game against UIC May 11, the Wildcats hit the road for the final time during the regular season as they travel to Michigan. 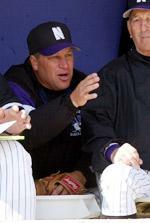 The 2010 regular season concludes May 20-22 as NU hosts Michigan State. The 2010 Big Ten Tournament is slated for May 26-30 and is being held at Huntington Park in Columbus, Ohio, for the second consecutive year.